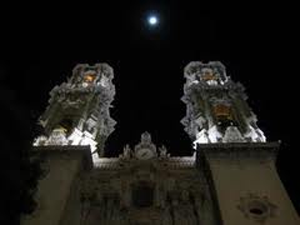 Mexico has three cities where silver jewelry is manufactured; Mexico City itself, Guadalajara and Taxco. 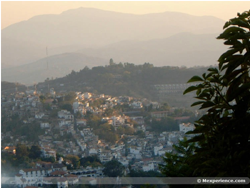 Taxco is known s "The Silver Capital of the World." 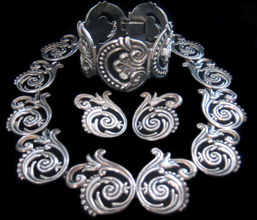 As the biggest silver producer in the world today, it is easy to obtain pure silver and most silver jewelry coming out of Mexico is made of sterling silver or .925 silver. Other countries more notably some of the Asian countries tend to dilute their silver to make it go further and it is very common to find some jewelry with just 0.800 silver content. Most pieces are hand finished by artisans called silversmiths who hand down their craft through traditional apprenticeships and along with an education these apprentices are given a passion and a love for their art. 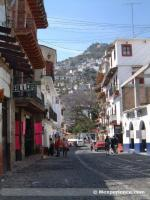 An intriguing combination of legend and fact the history of silver in Taxco is a story worth knowing. 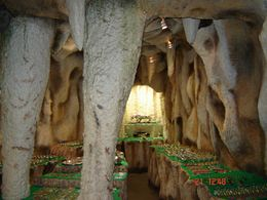 Originally Cortes himself opened the mines in the hills of Taxco after discovering that the Aztecs had been using silver for barter for centuries. In 1716 silver was re-discovered in Taxco by Don Jose del le Borda, when as legend has it, he was riding in the hills above Taxco and spotted a rich silver vein from the back of his horse. He became very wealthy as a result during a time when silver was worth almost as much as gold and in gratitude to the area built schools, roads and houses for the township. 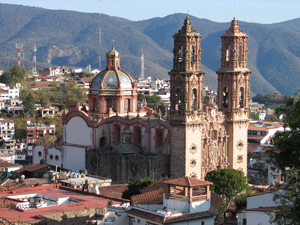 His most famous contribution to the area is the Santa Prisca Cathedral, built in the Spanish Baroque style which can be seen from anywhere in Taxco as it glistens in the sunlight. Mexico's war for Independence during the 19th century saw many of the mines destroyed as the Spanish barons fought to prevent them being lost to the revolutionaries. 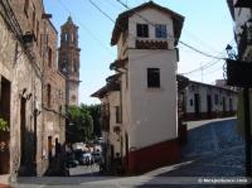 It wasn't until a chance comment was made to William Spratling, a US citizen and architectural professor who came to the area in the late 1920's to study Mexico and its culture that Taxco future potential as the world silver capital was realized. Apparently the US Ambassador commented to Mr Spratling that Taxco had once been the site of seemingly bottomless silver mines for centuries but had not ever been considered a location where jewelry and object of silver where designed and made. This got William Spratling thinking and he set about finding and nurturing the potential talent in the locals and motivating the artisans in the Taxco area to rediscover the craft of silver-smithing. 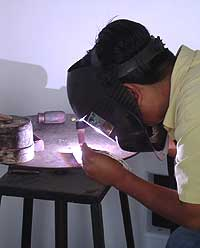 Using his own designs he created an apprentice-based training system, training the artistic young and eager people of Taxco and giving them the opportunity to develop their skill as artists and silversmiths. Within just a few years the quality and beauty of the silver workmanship coming out of the Taxco area gained worldwide recognition for Mexico and other cities where silver was mined soon followed suit. Williams first apprentices are now considered the old masters of Mexican Silver and Antonio Pineda, Hector Aguilar, Margot de Taxco, the Castillos, Ledesma and Chino Ruiz have produced and continue to craft some of the most highly prized and collectible pieces. 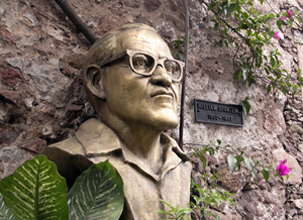 Mr Spratling became known as "The Father of Mexican Silver" before his death in 1967 in a car accident and a silver bust of Mr Spratling resides in the town’s museum to commemorate his contribution to Mexico and the town of Taxco. 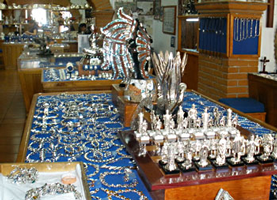 Every November Taxco holds it world famous 'Silver Fair' called 'Feria Nacional de la Plata' where craftsmen, artisans and silversmiths show their work and compete to win the prized award of 'Best Silver Artist of the Fair.' The local senorita's also vie for the title of, "Queen of the Silver Fair" and the fair is celebrated with fireworks, concerts, dances and exhibits. 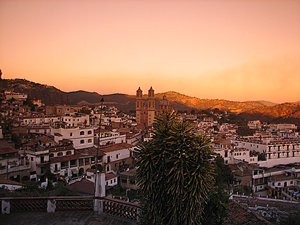 Taxco which is pronounced Tahs-ko, itself is located in the hills between Acapulco and Mexico City and is a city with a natural ambiance and charm with its red-tiled roofs, narrow, cobblestone streets that wind up and down the hills of Taxco. These streets are a bustling hive of activity during the day with street merchants, taxi's and shoppers all vying for space. 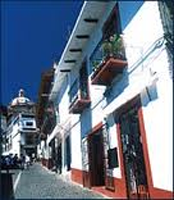 Over 16,000 silver shops line the tiny Plasa Borda, all streets lead to this, the main plaza in Taxco where bartering is an exciting adventure. Silver jewelry of every design can be seen in this tiny plaza and exquisite rings, necklaces, bracelets and bangles can be seen flashing in the sun and artfully draped over black clothes to test even the greatest willpower. For those looking for silver it is a Mecca and no-one can help coming back to their accommodation without snagging a bargain or two. Mexican jewelry can be found in every corner of the world and retains its value over the years because of its quality and unmistakable style. 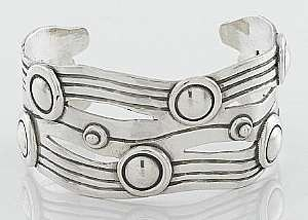 Silver is one metal that is getting rediscovered these days and silver jewelry has become “hot” in contemporary fashion. It is the taste of the decade and everyone wants a bit of it from the MTV hot-steppers to the conservative businessmen. Silver has a certain connection with the moon. Probably, that’s due to its shimmer and glow. The metal has been associated with various religious traditions and mystic beliefs. Magic and mysticism oozes out of it as it sparkles with a vibrancy that is ethereal. Silver has been used for Pagan ceremonies, used as a currency, has had trade value, and has been an ornament for decoration for those belonging to the highest strata of society. Silver has become useful in many more ways in our daily lives. For example, due to its extremely high optical reflection property it is beaten into paper thin sheets and used in making mirrors. Moreover, silver can also be beaten into extremely fine sheets which are used for treating windows in buildings. Just a few interesting bits of trivia for you; The name for the metal has its origin in the word “arg” which means “white” or “shining”. The scientific name for silver is “Argentum” and its chemical symbol is “Ag”. Classification wise, silver is described as a soft, shining metal with variable qualities. The metal is the best conductor of electric and thermal energies. Widespread usage for silver has been seen throughout different ages, for example, as coins, tableware, part of photographic equipment, ingots, and most of all, silver jewelry. Silver was regarded as a much more valuable metal than gold for many thousands of years. Pure silver is a malleable metal that can only be utilized in its true form when used in large quantities. It is more suitable for use as an alloy. 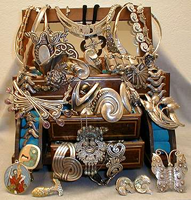 For silver jewelry making, it is more often than not, mixed with less than 8% copper. This makes silver jewelry less prone to getting scratched and losing its shape. When mixed with other metals, it is used for such diverse purposes as dental implants, cement, batteries, making brass objects and for electrical contacts. More amazingly, silver as an alloy is used for making rain through cloud seeding, and it can make a very powerful explosive. Many myths surround this metal of the royalty. Some believe that wearing silver brings wealth to a person; others say it has a calming effect. Another faction swears that it enhances psychic abilities making the wearer more intuitive. Although discarded by some as mere old women’s tales, silver is thought to prevent both food and wine from going bad. Mythological association of silver with vampires and werewolves has been the subject of many fascinating books and movies. Medical science also believes in the healing power of silver, especially when it comes to burn injuries. Colloidal Silver is used as an antibacterial. So next time you yearn for silver jewelry like that beautiful vintage Taxco choker or the sterling silver pin-brooch you couldn’t take your eyes off, you have a lot more reasons to buy them other than that they simply look marvelous.